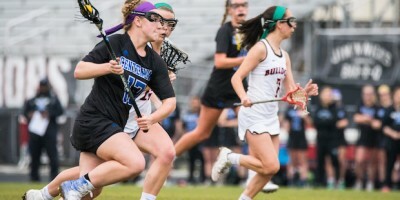 The Centennial girls lacrosse team’s 17-12 loss to Roswell on Tuesday marked the first blemish of their 2018 season. The Knights started their 2017 season off with nine straight wins before ultimately losing the majority of their remaining games. Now, after putting together another 9-0 run before their loss yesterday, the No. 8 Knights are out to prove that they can keep up their strong play for the rest of the year. Since taking over for longtime head coach Jill Irwin, Perling has led Centennial to two winning seasons and a 2016 playoff appearance after a two-year drought away from the postseason. Now, well into her third season as head coach, Perling and the Knights are looking primed for another playoff push. The Centennial offense has been a force to be reckoned with, averaging just under 20 goals each game while allowing just a bit above six. The Knights’ most recent win came after an 18-11 outing against Creekview, displaying quality offensive performances from several players. 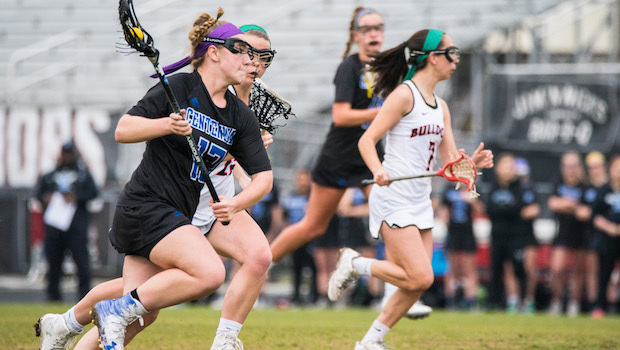 One standout performance came from junior Christina Fabrizio, who was leading the Knights offense with 35 goals and 12 assists heading into Tuesday’s game. Her five goals against Creekview helped fuel the offense, along with Haleigh Allario, Maria Fabrizio and Amelia Wright, who all scored three. The responsibility of holding down the midfield has been left to sophomores Ella Hancock and Abby Teffeteller. While the offense has been playing lights-out, the defense has stood strong as well. At the halfway point of the season, Centennial’s undefeated streak is over, but the Knights have no intention of letting one loss throw them off their course. The Knights’ next game is Thursday as they take on Brookwood. No Replies to "9-1 start propels Centennial girls lacrosse into second half of season"